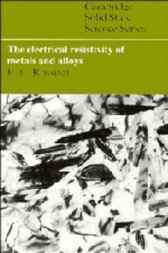 Now in paperback, this comprehensive book is the first text devoted to the problem of understanding the electrical properties of metals and alloys. Dr Rossiter, well-known for his work on the electrical resistivity of alloys, has written a book which blends results and theory, but does not rely on a strong grounding in quantum mechanics. After an introduction to the basic ideas, the concepts of atomic and magnetic correlations and their microstructural consequences are explained. Later chapters then deal with the effects of such correlations on electrical resistivity. Examples and applications of the concepts derived are given in discrete sections, allowing the uninterrupted development of theory for each specific problem, and enhancing the value of the book for a wide range of readers from theoretical and experimental solid state physicists to metallurgists and materials scientists. Anyone with an interest in the electrical conduction process or in the application of resistivity measurements to the study of alloy configuration will find this essential reading.